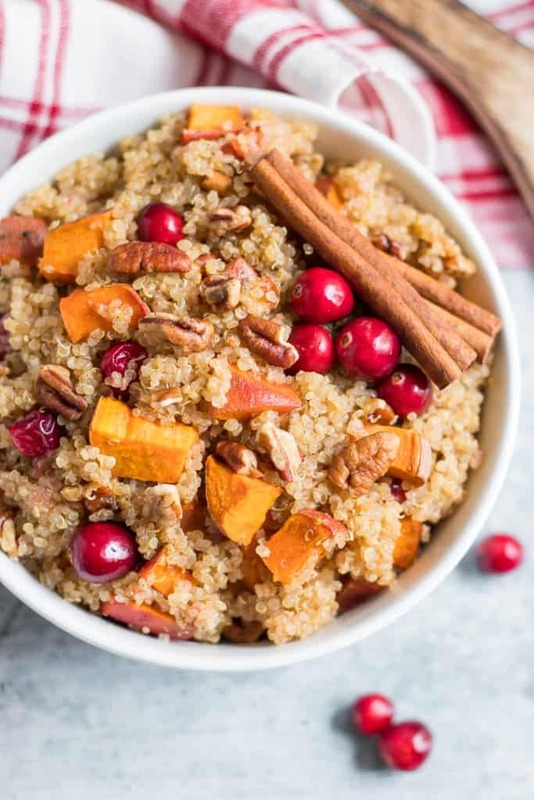 Perfect fall flavors come together in this Roasted Sweet Potato Cranberry Quinoa recipe. 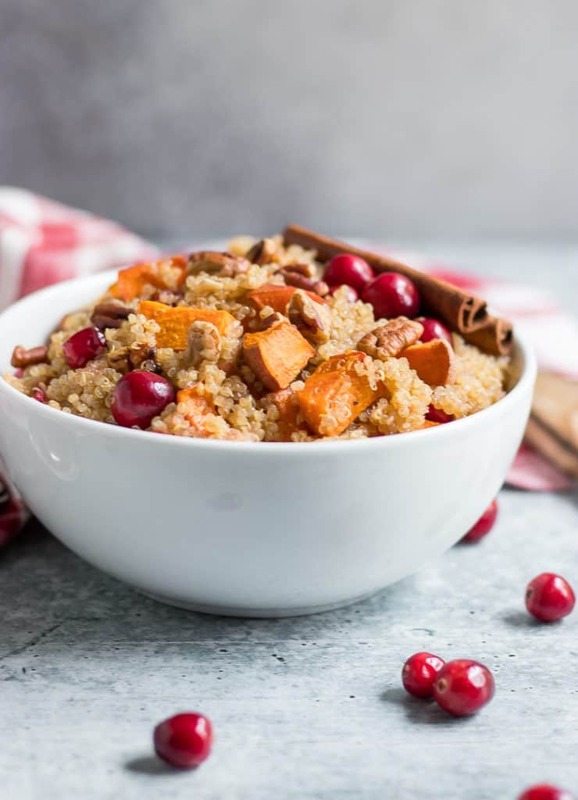 If you are looking for something different for your holiday spread or just love adding quinoa to your recipes, then you will love this easy side dish! It’s hard to believe that Thanksgiving is just around the corner. It is one of my absolute favorite holidays of the year. So many memories of trips to Gatlinburg with the entire extended family, Grandma’s stuffing and pumpkin pie, Thanksgivings at the Legion Hall when the whole family was too big to fit into a house, and so much more. For me, it’s a holiday without so much of the stress and people just get to come together and share; share food, share stories, share laughter. I am very blessed in the family department. About 95% of both sides of my family live within a 10 mile radius. Holidays have always been loud for sure, but that’s the beauty of it to me. And Thanksgiving is always the little reminder to me to look around and really see how good I have it. It’s really easy to focus so much on the things I lack and the struggles I have, but there’s something magical about this holiday that just gives me the nudge I need to wake up and see how lucky I really am. As Thanksgiving nears, the thoughts of sweet potatoes and cranberries, and all of the cozy foods connected to the holiday become constant. I typically have roasted sweet potatoes at least once a week and try to make a big batch so I have leftovers. 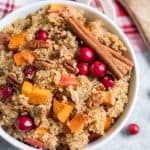 They are great to toss in salads, eat as a side or get creative in the kitchen as I did with this Sweet Potato Cranberry Quinoa. Fresh cranberries are everywhere now and I grabbed several bags the other day so I have been tossing them into everything. 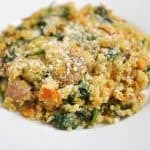 This recipe is a sweet and hearty quinoa recipe that ultimately could be eaten as a side or even for breakfast. It could be a great addition to your Thanksgiving spread to switch things up a bit from your typical dishes. If you can’t find fresh cranberries, dried can be used as well, but while they are in season, take advantage of the fresh ones. Also, you can skin the sweet potatoes if you prefer. I never do, but I know some may not want to eat the skin. Because the cranberries are so tart, adjust the maple amount to suit your taste. Hopefully, every spoonful of this quinoa will bring you the coziness and warmth of the holiday each time you make it! Place sweet potatoes on parchment lined baking sheet and coat lightly with coconut oil. Bake for about 30-40 minute or until soft. **In the last ten minutes of baking, add cranberries and pecans to the baking sheet and continue to bake with sweet potatoes until cranberries start to burst. In a mixing bowl, add quinoa and then top with sweet potatoes, cranberries and pecans. Add maple, coconut oil, vanilla, sea salt and cinnamon. Serve immediately with an extra drizzle of maple if desired. Optional: Feel free to add a dash of ginger, nutmeg or allspice to this recipe as well! So, is this served hot, warm, or cold ? Hi Pat! I ate it hot with a little bit of a maple drizzle. I’m sure it’d be fine warm as well. Honestly, I think I may try it cold next time as well! This is the perfect thanksgiving dish to pass! The combo of cranberries and sweet potato are the best! Nothing says thanksgiving like that!! My family is going to love this for Thanksgiving – thank you! I have a sneaky suspicion that leftovers would make a great breakfast… if there are any leftovers! I feel the same way about Thanksgiving – and this recipe! Really versatile! This is the perfect fall recipe!